Part 6: Overview Issues. 23. Empirical strategies in labor economics (J.D. Angrist, A.B. Krueger). 24. New developments in econometric methods for labor market analysis (R. Moffitt). 25. Institutions and laws in the labor market (F.D. Blau, L.M. Kahn). 26. Changes in the wage structure and earnings inequality (L.F. Katz, D.H. Autor). Part 7: The Supply Side. 27. Labor supply: a review of alternative approaches (R. Blundell, T. Macurdy). 28. The economic analysis of immigration (G.J. Borjas). 29. Intergenerational mobility in the labor market (G. Solon). 30. The causal effect of education on earnings (D. Card). 31. The economics and econometrics of active labor market programs (J. Heckman, R. LaLonde, J. Smith). 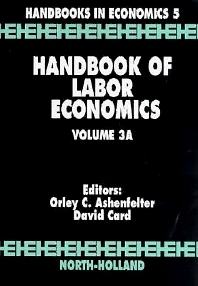 Modern labor economics has continued to grow and develop since the first volumes of this Handbook were published. The subject matter of labor economics continues to have at its core an attempt to systematically find empirical analyses that are consistent with a systematic and parsimonious theoretical understanding of the diverse phenomenon that make up the labor market. As before, many of these analyses are provocative and controversial because they are so directly relevant to both public policy and private decision making. In many ways the modern development in the field of labor economics continues to set the standards for the best work in applied economics. This volume of the Handbook has a notable representation of authors - and topics of importance - from throughout the world.